On a day with a -5 wind chill, the temperature throughout the city managed to plunge even further south on Tuesday once Atlantans got a look at the January issue of Stomp and Stammer magazine. The 17-year-old monthly ‘zine published and edited by veteran Atlanta writer Jeff Clark, is a self-described hodgepodge of “news, music, noise, opinion and garbage.” Across Facebook, Twitter, Instagram and Tumblr posts, friends, family and fans of Atlanta chef and restaurant owner Ria Pell are using the latter term to describe Clark’s 2013 In Review wrap up in the new issue. 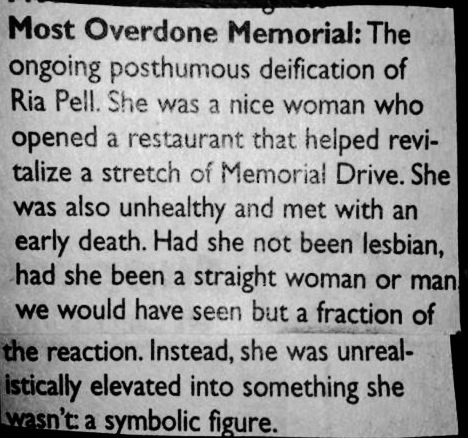 The columnist categorized the larger-than-life Ria’s Bluebird café owner’s Nov 30 home-going as the year’s “Most Overdone Memorial.” He went on to write: “The ongoing posthumous deification of Ria Pell. She was a nice woman who opened a restaurant that helped revitalize a stretch of Memorial Drive. She was also unhealthy and met with an early death. Had she not been a lesbian, had she been a straight woman or man we would have seen a fraction of the reaction. Instead, she was unrealistically elevated into something she wasn’t: a symbolic figure.” After a Pell fan snapped an Instagram image of the paragraph and posted it, the more than 5,500 fans of the chef’s Remembering Ria Facebook page mobilized. Since Pell’s death, friends and fans of the chef have used the page to post new bluebird tattoos they’ve gotten in honor of Pell and to spread the word about a Krog Street tunnel graffiti community project in Pell’s memory.